You may want to try Mt Hope area. On the border of Kitchener and Waterloo core areas. You get the best of both. I’ve been trying to find an online version of the real estate districts map for you, but it’s proving difficult! 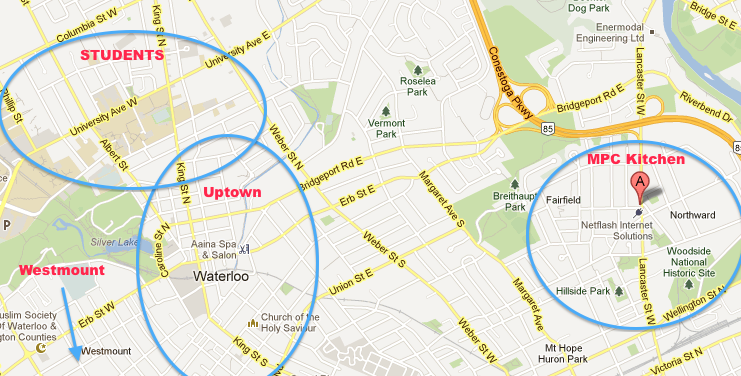 To help you out, here’s a summary of the areas I tend to keep an eye on… 15 is Old Westmount and the reason I say “south of William” is that above that you’ll start to get into a lot more student rentals. Not always, but more frequently. Definitely expensive to buy in this area, but you can sometimes find an affordable place to rent. 14 is my personal favourite and includes part of the southern Uptown core plus the blank area on your map extending east and south into Kitchener/Mt Hope area. This area has a lot of 1950s bungalows plus older (60+) 2-storeys as you start to get closer to Wellington St. The Wellington end has been up-and-coming for a while now and with the Breithaupt Block development, future LRT site, new Victoria Commons condos, and university expansions into the Kitchener core it’s likely to become an even hotter location very soon. Closer to Uptown, but still in 14, the neighbourhood is going through a turn-over phase where older, empty-nesters – some of whom have been here since they first built in the 1950s – are moving out and younger families are moving in. The catch is, there are very few rentals in this area and the “good” houses are selling in a matter of days. Literally. A house just down the street from us sold in under 48 hours for at least 20k over list. Finally, 16, is in the upper middle part of your map starting roughly north of Bridgeport and east of Weber. Slightly less walkable to the core/shops, but still a great neighbourhood and with a wide mix of homes including a lot of larger homes for future consideration. I’d probably avoid the townhomes on the northern part of Bluevale though. Not the nicest spot in my opinion. One last note, the area just east and south of Breithaupt Park – captured it in your MPC Public Kitchen circle – has some good finds. I’m not sure what district this is technically part of – possibly 14 or maybe another number – but as long as you stick to the section between Margaret and Lancaster you should be good. As you mentioned, the area closer to Lancaster is still “up and coming” and has a ways to go yet. Good luck! WOW this is amazingly helpful!. Thanks for taking the time. Very interested in looking into District 14 (Wellington area). Thanks for some insider scoop!